My Jane Austen Pilgrimage consisted of visiting Bath on January 23 2016. It was an outing with my host mother, who is also a fan of Jane Austen. My fellow host sister Elizabeth Minson went a long for the journey. We started the day eating at the pump room and drinking the water from back in the day. It was 25 degrees Celsius and contained 46 minerals. After we drank the water we decided to see the Roman baths that are located next to the pump room. We then proceeded to the Jane Austen Museum, and the crescent. While walking the hills of Bath all I kept thinking was, I was literally walking in Jane Austen’s shoes. Not only while walking to the Jane Austen Museum, but through Bath, and the pump room. While at the Jane Austen Museum I got to try on the empire waist dresses and bonnets. I also wrote with a quill pen, which is what Austen must have used to write. I think I got more ink on my fingers than the paper. It was still cool to see a little bit about Jane’s works and life. I was more amazed to be in the town where she lived and breathed. Taking a moment to be in Jane Austen’s shoes was not like any experience I have had. I was able to visit the pump room, drink the water she drank, walk past the house she use to live in, visited the circus and crescent all by walking in Austen’s shoes. Not only was I learning about Jane Austen, but I was able to view the architecture of the buildings in Bath. I learned that I am very fond of the architecture in Bath and would love to visit again. I was also able to create a fun memory with my host mom and fellow host sister. This pilgrimage was truly an amazing experience and a wonderful memory! I have been in love with Hans Christian Andersen and his fairy tales since I can remember. While the movie I was, and am, obsessed with is not exactly an accurate depiction of his life, Hans Christian Andersen, directed by Charles Vidor, sparked my interested in Andersen’s fairy tales. I recalled his most popular stories by singing the songs Danny Kaye sings in the movie. His stories always left me happy, sometimes confused, as he was a unique author. Hans’ travels to Copenhagen inspired me to do the same at a young age, and my opportunity at Harlaxton College allowed my dream to come true: I got to walk to same streets that Anderson walked in the 1800s. From visiting Copenhagen, I was able to expand my knowledge on Andersen’s life. I did not realize he traveled as much as he had or that he was in fact such an awkward person! His overwelcomed stay with Charles Dickens made me laugh because I could imagine this happening just from listening to his sometimes awkward and seemingly incomplete short stories. I learned that he was once named the Greatest Dane and was highly valued by the public. I felt connected not only to him but also to my childhood self, which helped reawaken my silly side. This experience truly was amazing. To say I sat on Hans Christian Andersen’s lap makes me smile days after the fact! This particular pilgrimage only enhanced my appreciation and love for a childhood favourite (and left me singing some of my favourite songs from the movie!). This guest post comes from Sarah Barnette, a DPhil candidate at Oxford University, currently researching mid-to-late 19th century conceptions of sympathy in the fiction of women writers. She is expected to complete her degree in 2016. As I’ve perused the Postcard Gallery, I’ve been astonished to see how each entry differs so vastly from the next – visiting literary sites is truly a complex and nuanced act. It can be a sign of respect or way of “entering into” an author’s experiences. It might be an attempt to conjure an author’s ghost or, surprisingly, it may entail a lesson in learning more about the people around us today. 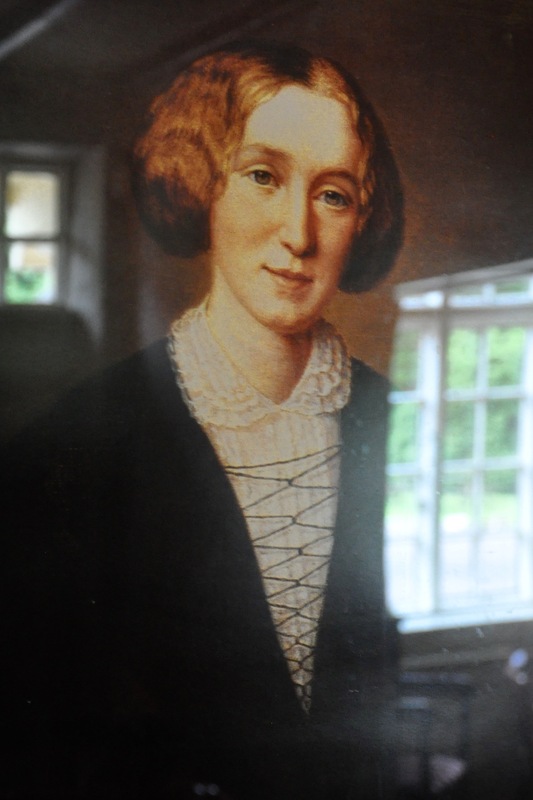 The writing of the author whose home we visit also colors our experiences, and in my view the work of George Eliot is particularly conducive to literary tourism. There is no sense of ease like the ease we felt in those scenes where we were born, where objects became dear to us before we had known the labour of choice, and where the outer world seemed only an extension of our own personality. Eliot used to accompany her father Robert Evans like this when he drove around conducting business. Robert was the agent of the Arbury Estate, the home of the local landowning family in Nuneaton, and here we find the brighter side to this story. As it turns out, not every place associated with Eliot’s early days has been lost or altered beyond recognition. Arbury Hall exists very much as it once did when Eliot’s father arrived in 1806. The vaulted ceilings and Gothicized interiors that Eliot saw as a child and remembered in her adulthood (she describes them in “Mr. Gilfil’s Love Story”) remain for today’s visitors to enjoy. South Farm, the place where the Evans family initially settled and where Eliot was born in 1819, still stands tranquilly along the side of a small lane that winds its way from the main gate of the Hall. South Farm is even occupied by the current estate agent and his family – an almost poetic detail linking Eliot’s “then” with our “now.” Nearby, the church where Eliot was baptized and the village school across the street that she once attended – Chilvers Coton Church and Chilvers Coton Centre – continue to serve the community. For those of us who may be disappointed with encroaching car parks and traffic whizzing past on busy streets, there’s another church nearby that Eliot also knew that still looks and feels very much like a country church. Astley Church lies outside Nuneaton’s urban sprawl. Instead of being bounded by asphalt, it sits adjacent some inviting fields and the recently renovated ruins of Astley Castle. A quiet churchyard rests in the shade of surrounding trees and the interior, which Eliot describes in “The Sad Fortunes of the Reverend Amos Barton,” still looks as though the author might have just walked in to remind herself of some details for her story. This past May my husband and I had a chance to explore these places with the George Eliot Fellowship, a literary society based in Nuneaton. Founded in 1930 to preserve and enhance Eliot’s memory, the Fellowship’s calendar of events includes an annual tour, and I was surprised (and delighted) by how enthralling the experience of roving around Eliot’s old stomping grounds actually was. The Fellowship’s Chair and Vice-Chair, John Burton and Vivienne Wood, have perfected the combination of reading from Eliot’s work while standing at the various sites she describes. As the day went on, the myriad ways in which Eliot revisited Nuneaton in her imagination and lovingly embedded it in her writing became clearer and clearer. I felt myself becoming more and more able to imagine and sympathize with Eliot’s struggles of not being able to return home. The final stop of the tour was really its epicenter: Griff House, a red-brick Georgian-façade farmhouse that was Eliot’s home from 1820 to 1841, where she grew from a newborn infant into a young woman. The hospitality company Whitbread currently owns the property and they’ve made a few changes since Eliot’s time. Attached to the back of the house is a Premier Inn (a modern addition that thankfully isn’t visible if you approach Griff House from the front) and installed in the house’s ground floor is a Beefeater Restaurant. Perhaps not the ideal fate of George Eliot’s beloved childhood home, but since the farmhouse is now listed as a Grade II English Heritage site and Whitbread has ample funds for the building’s maintenance, the farmhouse is well looked after. The manager’s family even occupies its upper floors and so the place, fittingly, remains a home. The farmhouse’s outbuildings are a different matter, however. The farmyard of Griff House was once extensive, but is now divided into two sides. Neither side has had much use over the years (bizarrely, one of the buildings straddles the dividing line between the two properties, with a brick wall cutting right across its middle). 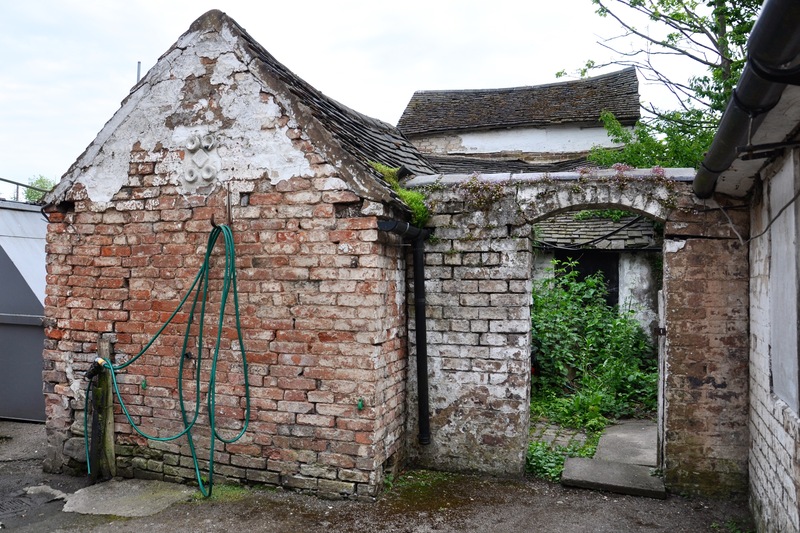 These outbuildings – once the life and breath of the farm – are rickety, ramshackle structures now, and the English Heritage listing doesn’t include them. So, in 2012 Whitbread requested their demolition. Fortunately, the George Eliot Fellowship not only acted in time to save the outbuildings, but also secured permission from the local council to transform the dovecote into the George Eliot Heritage Centre. I thoroughly enjoyed hearing John and Vivienne eagerly share this success story – we walked all around the dovecote as they explained their plans to have a Heritage Centre that offers exhibition space, a reading room and library, and storage for the Fellowship’s archives. It was easy to see their warm enthusiasm about being able to welcome school students, scholars, historians, artists, and, of course, literary tourists to the Centre once it opens. And they’re not the only ones excited to get started on this work and see the George Eliot Heritage Centre become a reality. As the conservation work drifts closer, Rebecca Mead and Kathryn Hughes have written articles nudging their readers in Nuneaton’s direction, siphoning attention away from the hubbub surrounding Michael Bloomberg’s recent purchase of Eliot’s London home in Chelsea and redirecting it northward. My husband and I also wish to direct attention towards Nuneaton. We’re currently in the beginning stages of a digitization project related to this transformation. Once on-site work begins, we’ll be digitally documenting the development of the Centre, and as a part of this we plan to interview members of the George Eliot Fellowship, capture the tour experience, and talk with people in the local community who want to be a part of conserving cultural heritage sites. We hope to give some immediacy to the voices of today that are trying to preserve the legacy of George Eliot in concrete ways outside of her texts and beyond academia. Like the dark rooms hidden away at the back of No. 142 Strand, these places have a lot to offer in terms of telling parts of Eliot’s story, and there’s a chance that this visual project will encapsulate some of these lessons, while also encouraging literary tourists to come and experience these places for themselves. For more information, keep an eye on this site and follow the George Eliot Fellowship’s Twitter account, @GeorgeEliotLove. G.S. Haight, George Eliot: A Biography, Oxford: OUP, 1968, pp. 3-4. Quotation from Chapter 12 of Middlemarch. This post comes from Sarah Barnette, a DPhil candidate at Oxford University, currently researching mid-to-late 19th century conceptions of sympathy in the fiction of women writers. She is expected to complete her degree in 2016. I can see her now, with her hair over her shoulders, the easy chair half sideways to the fire, her feet over the arms, and a proof in her hands, in that dark room at the back of No. 142. In the early 1850s, George Eliot was living at 142 Strand, the London headquarters of the radical Westminster Review, working anonymously as its editor and flexing her muscles as a journalist. She was still known as Marian Evans at the time, and she hadn’t started to write fiction yet. William Hale White was a fledgling writer who also lived and worked out of No. 142 in the early 1850s, and we have him to thank for this evocative image of Marian sitting and reading by the low light of the fire in her room. She occupied two dark, but very quiet rooms at the end of a long passage which runs back from the front and at right angles to the street. White’s depictions of Marian are short, but enticing. And it’s interesting how he always carefully describes her within the walls of No. 142 – an address that had quite an avant-garde reputation. For White, who published these memories a few years after Eliot’s death in 1880, it was important that the public knew her not only as the illustrious respectable novelist, but also as a fierce intellectual who led an “entirely unconventional” life. “She was really one of the most sceptical, unusual creatures I ever knew,” White claims. He knew how essential placing Marian in the rooms of No. 142 was to his portrayal of her precocious and provocative side. The Elms, where Eliot was schooled as a little girl from 1828 to 1832, was demolished in 1960 to make way for road widening, while the boarding school Eliot attended in Coventry from 1832 to 1835 is now a real-estate agency. 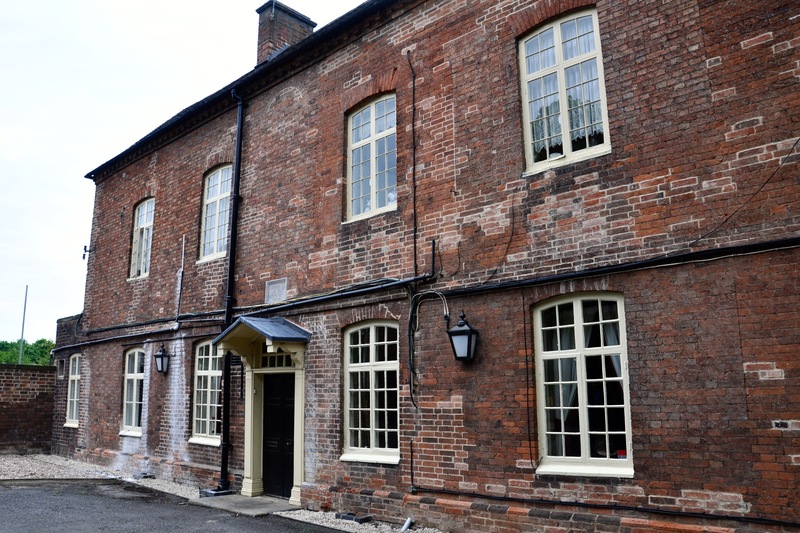 Bird Grove, where Eliot lived with her father from 1841 to 1849, was recently serving the Bangladeshi community in Coventry as a cultural and job training centre – but now it sits unused and untended. Rosehill – the home of Eliot’s close friends the Brays and the place where she used to spend hours socializing, playing music and meeting influential figures of the day like Ralph Waldo Emerson – once sat within easy distance of Bird Grove. But this building was also knocked down. It’s strange to think of how many places affiliated with Eliot’s personal history have been treated as if they’d had no Victorian celebrity affiliation at all. George Eliot has been a seminal figure in the annals of Victorian literature for decades. Today, nearly every English literature curriculum – worldwide – features something from her oeuvre. But, unlike the fans and students of Austen, Dickens, Gaskell, or the Brontës, Eliot-acolytes seem less interested in the spaces she once occupied, and the Midland landscape she loved. Why is this? George Eliot was once told that she had “a very large brain,” and I wonder if somewhere along the line we decided to define her by this standard. She’s turned into an author to be enjoyed cerebrally – in the classroom under a studious and scrutinizing gaze – rather than an author associated with the pleasures of literary tourism. Eliot is well known for the lessons she gives her readers about how to sympathize with people. But I think there’s much more to her work than this interpersonal sympathy – she also explores sympathy as a link, forged in childhood, between person and place. Her fiction highlights the importance of meditating upon the creative influence and power of spaces, especially those associated with childhood memories. Such connections demand greater scrutiny, as the second installment of my blog post will explore next week. W.H. White, “Literary Gossip,” Athenaeum, 28 November 1885, pp. 702. W.H. White, “Dr. John Chapman,” Athenaeum, 8 December 1894, pp. 790. Wessex has become synonymous with the works of Thomas Hardy. He, more than any other writer, uses real locations as the background to his novels and poems. If you live in Dorset, as I do, it’s all around you. When I retired from a working life in mainstream and prison education I decided to indulge my twin passions, Hardy and walking. 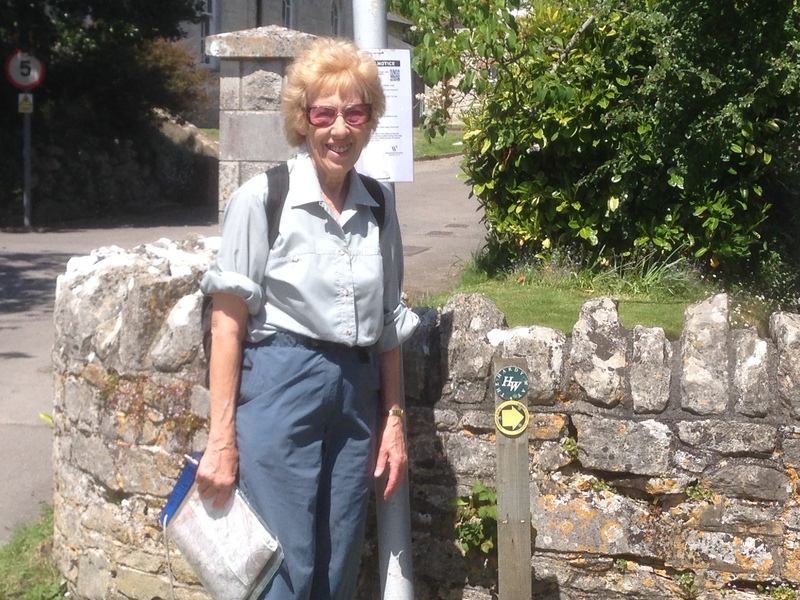 It didn’t take long for the idea of a long-distance literary footpath to evolve. How to start? I needed to read everything that he had written or I might miss something. This took quite a while because en route I listed the names of all the fictional places that had been identified as based on actual locations. This ranged from the very well-known such as Casterbridge/Dorchester to the more obscure – Little Hintock/Melbury Bubb (The Woodlanders). Even then there was always a question mark over exactitude. The word ‘probably’ was key. Next I had to plan a route that linked the places most economically distance-wise on public rights of way. This amounted to about 220 miles! Of course it is possible to break this up into sections but I describe my walk as The Hardy Way – A 19th-Century Pilgrimage. Pilgrimages are usually long and quite arduous so in its purest form the Hardy Way is a long distance path. Also pilgrimages usually end in a holy place, which is why I wanted my route to start at Hardy’s birthplace and to end in the quiet country churchyard nearby where his heart is buried. The best bit came next. The field work. Actually getting out there with Ordnance Survey maps walking the route and discovering the places that I had read about. In spite of ‘progress’ there are many locations that remain almost unchanged. The persistent hum of traffic recedes to be replaced by a silence that evokes, for example, the bleak uplands of West Dorset where Tess worked in bitter weather grubbing turnips at Flintcomb Ash farm – Church Hill above Plush. Of course quite often the route hits the twenty first century. On the two magnificent ‘Jurassic’ coastal stretches from Lulworth Cove, which Hardy visited by paddle steamer in 1868, to Kimmeridge Bay and from West Bay to Weymouth via the Isle of Portland – Trumpet-Major country – things are very different with little pretence of solitude but because the coast is so beautiful it doesn’t seem to matter. 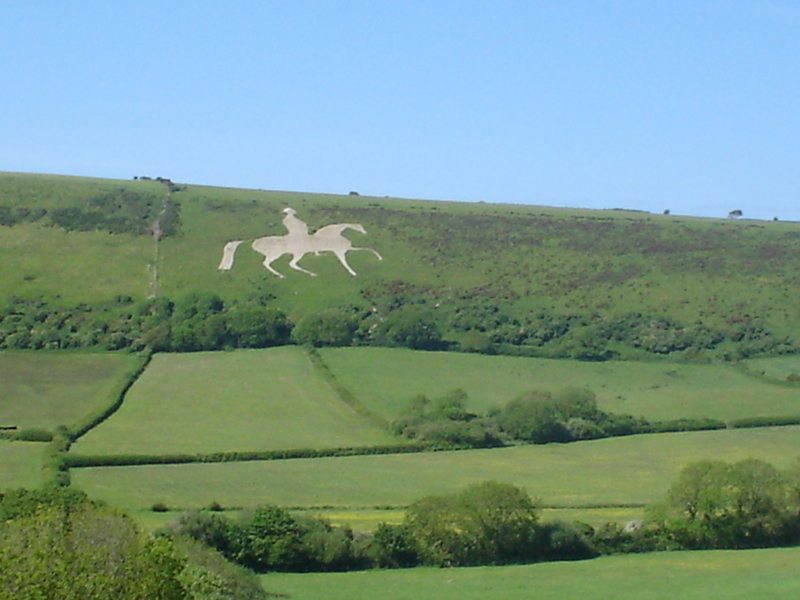 Hardy describes the gaiety of Weymouth when George III visited every summer and drilled his troops on the Ridgeway above the town as a Napoleonic deterrent; the figure of the King on his horse is still clearly engraved in the chalk to prove the point. My final objective was to ‘write it up’ linking the route to historical fact and to fictional description and extracts. I decided upon an unusual pagination device: the left-hand literary pages to read consecutively: similarly the right-hand route directions and factual information. The whole to tally as closely as possible. This was very difficult to achieve but I think worthwhile. It’s user friendly. 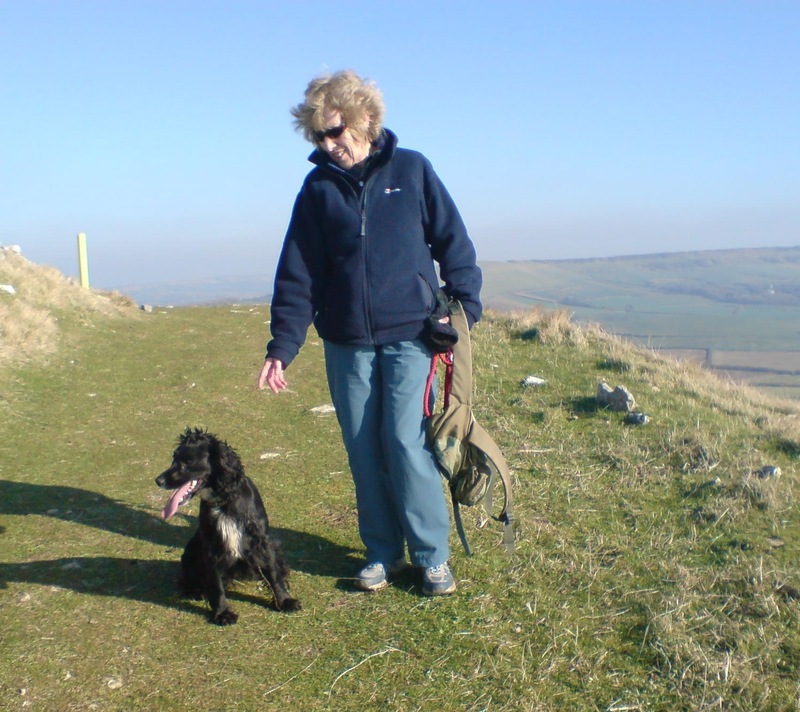 After the publication of my book I was delighted when Dorset County Council decided that they would like to adopt the path and to waymark it. Local accommodations have hugely supported it and a great many of them have copies of my book for their guests to enjoy. The Thomas Hardy Society, Tourist Information Centres and Hardy’s Birthplace Visitor Centre – a new venture- have also been very supportive in promoting the book. I hope that it is contributing to the local economy as well as creating more interest in all things Hardy. Most important of all I have had excellent feedback from walkers some of whom have stated that walking the route has made them want to revisit Hardy. My next objective is to try and extend this interest to young people and I’m working on that one! In 2011, I attended one of the early private tours now run by the Parsonage, which allows visitors special access to certain relics as well as a private tour of the house. One of the benefits of the tour was you were allowed to touch the relics and so I picked up Anne’s pebbles and instantly became upset. 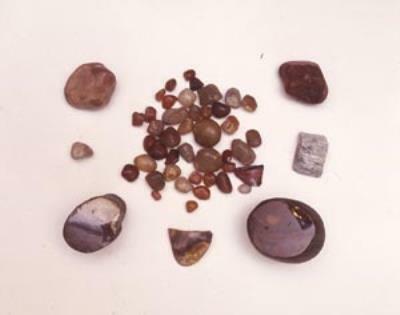 Anne collected these pebbles in Scarborough, where she first visited with her charges when she was working as a Governess, and it remained a site of happiness for her. She also went there with her sister Charlotte and her friend Ellen Nussey when she was dying of consumption, and we know from letters that they took Anne to the beach shortly before she died. Whilst the Parsonage cannot confirm which visit the pebbles are from, in my mind these were the pebbles she picked before she died. These were the symbol of a young woman trying to hold onto a world she did not want to leave, to me that was heart-breaking. [i] Many thanks to Sarah Laycock at the Brontë Parsonage for providing me with these details. [ii] Deborah Lutz, “The Dead Still Among Us: Victorian Secular Relics, Hair Jewelry, and Death Culture.” Victorian Literature and Culture 2011; 39, pp. 127-142, (p. 128). [iii] Winifred Gérin, Anne Brontë (London: Thomas Nelson and Sons Ltd, 1959), p. 320. [iv] Andrew McCarthy, ‘Introduction’ in Ann Dinsdale, Sarah Laycock and Julie Akhurst, Brontë Relics – A Collection History (Yorkshire: The Brontë Society, 2012), pp. 4-5, (p.5). 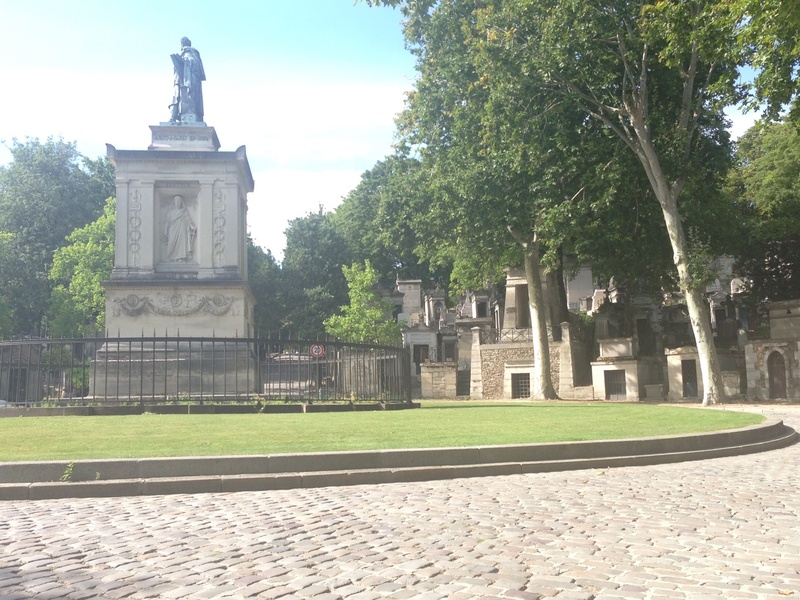 In late July this year, I found myself two metro stops from Père Lachaise Cemetery in Paris. A Paris visit had been tagged on to a trip to Disneyland Paris organised by my partner’s parents to celebrate their retirement. No specific plans were made until we arrived at our apartment. I noticed that we were within walking distance of Père Lachaise cemetery where I remembered that Oscar Wilde (1854-1900) was buried. I also recalled that his grave had become a site of veneration or pilgrimage for those that connected with both the man and his work. My PhD focused partly upon the Pre-Raphaelites so I had read The Importance of Being Earnest (1895), Lady Windermere’s Fan (1892), The Picture of Dorian Gray (1890) and a selection of his poetry: I was also aware of the aestheticism movement. However, I did not have a personal link to Wilde, even if I could appreciate his work. Curiosity and opportunity got the better of me and I decided to go and have a look. Père Lachaise was opened in 1804. However, it was considered to be too far away from the city and was not immediately popular. The bringing of the remains of Jean de La Fontaine and Molière proved to be a marketing success and the cemetery began to grow in popularity. Now it houses over one million human remains. Other Victorians of note buried there (according to its official website) are: Georges Bizet (1838-1875), Frédéric Chopin (1810 -1849), Marcel Proust (1871-1922), Eugène Delacroix (1798-1863) and Gustave Doré (1832-1883) – to name a few. As anyone who has visited the cemetery or similar grand cemeteries like Recoleta in Buenos Aires, Highgate in London or Forest Lawn in Glendale, California will appreciate, it has a strange kind of beauty. You can wander down corridors filled with Neo-Classical, Gothic and Post-Modern architecture. To the discerning eye it is a feast of artistic traditions and history and yet it is a city for the dead – and now, more often than not, the rich. I responded with a mixture of childish wonder at the strange environment (this is the first cemetery that I have visited as a tourist) and disgust. I was unsettled by the prospect of a million rotting bodies and the opulence of their memorials. It’s potentially a nice thought to be buried alongside Oscar Wilde and other French cultural dignitaries. The only problem is that the standard lease of a plot is just 30 years and there is a waiting list – you also have to either have lived or died in Paris. Wilde did fit this bill. He was born in Dublin, Ireland, but spent periods of his life in Paris and died penniless in the city in 1900. Three years before Wilde’s death, broken from his imprisonment in Reading Gaol and with British Aestheticism drawing to a close, he returned to Paris to live as an exile on the continent. He was initially buried in Bagneaux Cemetery but was transferred to Père Lachaise in 1909, though his tomb was not erected until 1914. Unlike other grave sites within the cemetery, Wilde’s has been protected by a glass casing since 2011 because of the tradition, started in 1900, of kissing the monument with red lipstick and writing messages directly onto it instead of leaving billets doux. The tourists neither realised nor cared that the constant cleaning brought on by this was disintegrating the stone work. Although I completely understand and respect the decision of Wilde’s family to put up the encasement, it has the effect of making the viewer feel removed from the object. There is more of a feeling of museum than monument, which perhaps prefigures its eventual fate (if it is deemed important enough) to be saved for posterity. Ironically, the original sketches for the tomb are thought to have been derived from the Winged Assyrian Bulls, currently held in the British Museum in London. However, its final version sculpted by Jacob Epstein (1880-1959) features a crucified angel-like figure that is wearing an elaborate headdress. The back of the sculpture has lines inscribed from The Ballad of Reading Goal, written by Wilde in 1898 during his period of exile in France. It’s easy to see why these words still resonate to the visitors of Wilde’s monument. Yet, I’m not sure that they meant much to me and neither did the gravesite – beyond satisfying my own curiosity. 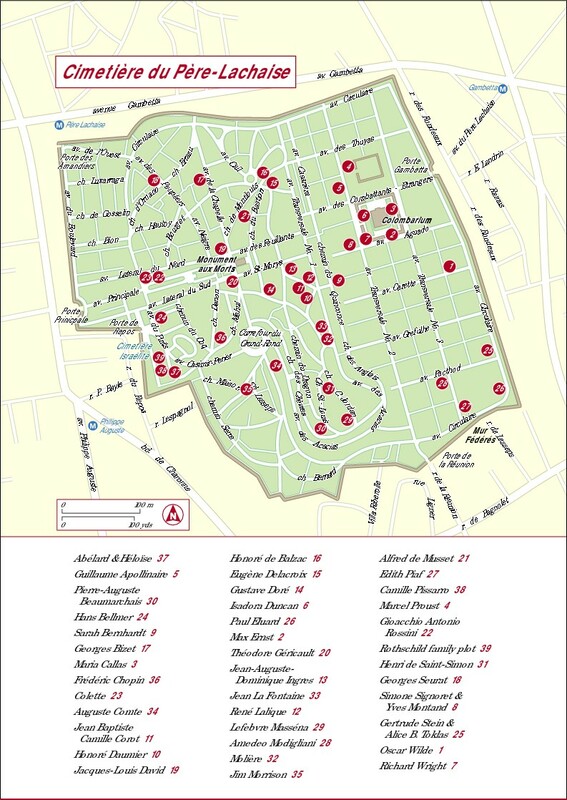 Which leads to the final question, what did I get from the experience of going to Père Lachaise? Mostly, I was interested in people watching; noting how they reacted to the tombstones of people that they were likely to have never met. Some people were solemn and pious, there were those mainly interested in taking photos whilst others seemed bemused as they were route marched round by an organised tour. Like Baudelaire’s Flâneur, Walt Whitman or Dickens, transposed from the streets, I hungrily observed the physical and emotional responses of others to this unusual environment on the periphery of the metropolis. Yet, I also wanted to take in the experience myself– to just see how I would react – and isn’t this partly why we read in the first place? There is an almost symbiotic relationship between reading and literary tourism in which the physical and intellectual experience of tourism informs and influences reading, and vice versa. However, I am yet to find out how my experience of visiting Wilde’s grave site will influence my future reading of his work. Perhaps I will start to envisage his voice as the uncanny angel-creature. 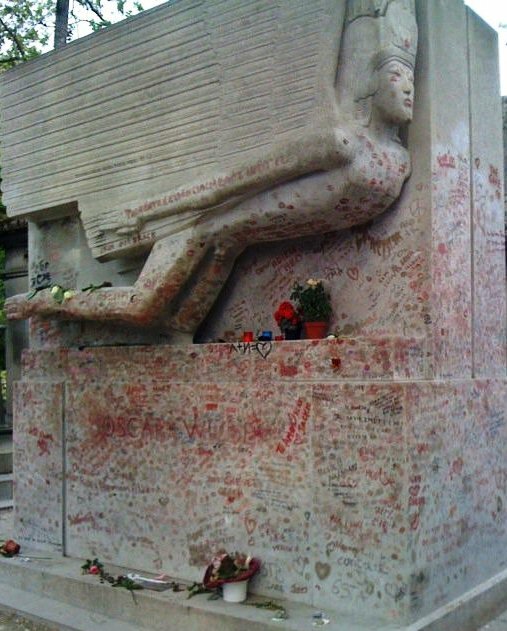 Alberge, Dalya, ‘Oscar Wilde’s Lipstick Covered Tomb to be Protected’, The Observer, 27 November 2011. http://www.theguardian.com/culture/2011/nov/27/oscar-wilde-grave-paris-cemetery [Accessed on 14th August 2015]. Gagnier, Regenia, Idylls of the Marketplace: Oscar Wilde and the Victorian Public, Stanford: Stanford University Press, 2002. 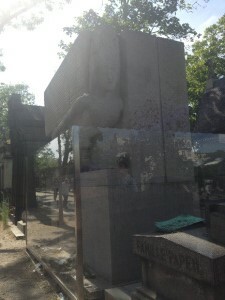 ‘Oscar Wilde’, Poet’s Graves http://www.poetsgraves.co.uk/wilde.htm [Accessed on 14 August 2015]. Raby, Peter, ed., The Cambridge Companion to Oscar Wilde, Cambridge: Cambridge University Press, 1997. Wilde, Oscar, The Ballad of Reading Gaol, London: Smithers, 1898.